When I think about Governor Rauf Aregbesola of Osun State, I remember the aphorism that the road to hell is paved with good intensions. In today’s class of 36 governors, it is doubtful that anyone has the progressive and performance pedigree of Aregbesola before attaining their current office. I will explain. As Commissioner for Works and Infrastructure under Bola Tinubu’s direction in Lagos State between 1999 and 2007, Aregbesola benefitted from the brand equity of the effectiveness of that administration. Tinubu it was, who set the template and pace for the heroic status that his successor, Babatunde Fashola would eventually attain and anyone, lucky to have served under him, tapped from his reputation, not just as a performer but a politician of solid progressive persuasion. While a fragment of this perception came from the then governor’s membership of the coalition that fought the military out of power in Nigeria, his one-man resistance army against the totalitarian tendencies of the Obasanjo Presidency further coagulated Tinubu’s status as a man of the people. Aregbesola, like many others, benefitted immensely from that. It was from this commissionership that Aregbesola contested to be Osun State governor in 2007. However, incumbent Prince Olagunsoye Oyinlola was declared winner of the election and Aregbesola took the next three years to fight a legal battle. In November 2010, a panel of Justices of the Ibadan Division of the Court of Appeal declared him winner of the 2007 election and ordered that he be sworn by noon of the day after the court decision. In the initial petition before the Election Petitions Tribunal, Aregbesola called over 100 witnesses and tendered 168 exhibits; he presented forensic evidence and came out of matter with the image of an irrepressible political Lion. I am sure the governor saw himself in that formidable light. On assumption of office, he made some of the most audacious promises the world would ever see. It is impossible to determine whether the governor counted his costs before embarking on some of the projects he took on but evidence before the end of his first term showed that he ventured for fruits on trees much higher than he could reach even with the aid of a pole pruner. Aregbesola started road projects that were neither necessary nor achievable even if he were to be governor for double his tenure; he introduced several innovative policies which should bestow an enviable legacy on his administration but have unfortunately become his albatrosses. One of those is the elaborate education reform in the state. Early in 2011, he had set up an educational summit under the chairmanship of Prof Wole Soyinka. This gathering came up with a series of recommendations some of which were adopted with amendments. For instance, while the summit recommended that the state government should approach publishers for mass production of text books for schools, the government introduced customised computer tablets which contained 63 textbooks covering 16 subjects, virtual class lessons and thousands of past examination papers. Known as Opon Imo or Tablet of knowledge, the device was initially provided for about 150,000 pupils in the state. It provided for the study of the three main religious persuasions of the people. The government also embarked on a comprehensive restructuring of the educational system in the state. Some of the steps taken were the reclassification of the system, a step which saw the grouping of schools into elementary, middle and high, from Grade 1 to 12. But the near anarchical situation in the Osun State education sector over the past two weeks is indicative of everything but the reversal of any scandalous educational rot. 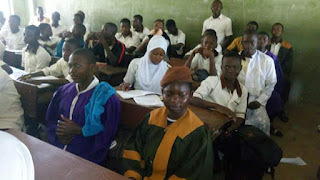 In the aftermath of a recent judgment of an Osogbo High Court presided over by Justice Jide Falola, which granted the right of female Muslim students to wear hijab(veil) in all primary and secondary schools in the state, Christians who seem unhappy with the judgment, have drawn a battle line with Muslims and the government. On the heels of Falola’s judgment, the state chapter of the Christian Association ofNigeria threatened to instruct Christian pupils to appear in church garments if Muslim girls were allowed to wear hijabs to schools. This threat was, in fact, carried out at the Baptist High School, Iwo, last Tuesday, in spite of the court judgment. Reports indicated that but for the intervention of the paramount ruler of the community, the situation would have degenerated in the course of parents of both faiths insisting on their religious rights. While the Muslim community hung onto the judgment, Christian leaders were said to have claimed to have, at the outset, advised government against the merger of schools founded by Christian organisations. A Christian leader was quoted as saying that government assured them that pupils would not be allowed to wear hijabs in schools founded by Christian organisations. However, these institutions remain public schools as a result of the takeover of all schools by the old Oyo State Government in 1975. Some parents have also attributed the increase in the activities of cultists in some secondary schools in the state to the homogeneous uniform which makes it difficult to pick out schools from which such pupils emanate. Here, now, is the shame of the situation. While the government itself does not appear to have thought through some of its policies, parents in the state have abandoned the ultimate educational goal of their children for the irrelevance of mere uniforms. While parents are drawing daggers over school uniforms, their children continue to lag behind in their school certificate examination results, something that most usually terminate the education careers of people. Take the May/June, 2015 West African Secondary School Certificate Examination ranking for example. Osun State came a scandalous 29th in the table of 36 states which fielded candidates. 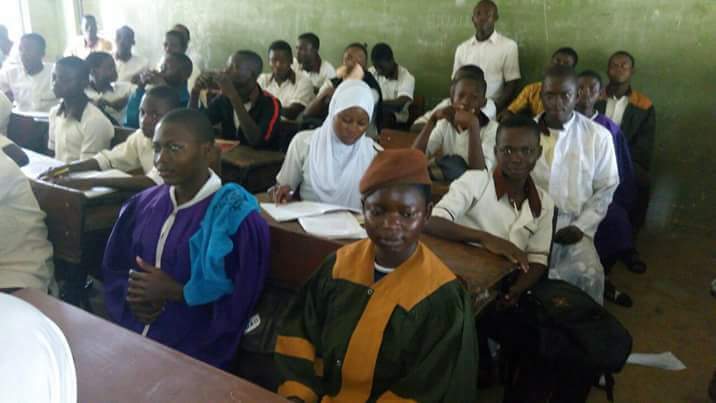 These results indicate that of the 48,818 candidates who took the examination in the state, only 8,801 obtained credits in at least five subjects, including English Language and Mathematics. Some of these parents are said to encourage their children to discountenance constituted authorities, even emboldening them to prepare for violence! You then wonder how such people deal with their conscience when these children become outlaws and a threat to the nation in the future. These ill-tutored young people will not just ruin Nigeria; they will also be unable to compete with their mates from more serious territories. At the moment, countries like Ghana, which has the population of just one state in Nigeria, are doing better in the education of their children than the so-called giant of Africa. How do we then compare ourselves to countries like China where students go as far as tying their hair (with clothespins or scarves) to ceilings in an effort not to fall asleep while studying? The idea is that every time they nod off, the pins will pull on their hair, jerking them awake. How do our own laid back, over-indulged and misguided youths compete with such hardworking children in the future? And for Aregbesola, rather than threaten to expel pupils from school and worsen the situation at hand, he should reverse policies that engender animosity in place of unity and progress. Education is sure worse off in Osun State today than what the governor envisaged at inception; so, there is a need for a recalibration. If he does not accomplish as much as he set out for in the delivery of infrastructure to the state, there could no legacy like the entrenchment of an effective educational system for which generations will be proud of. That cannot happen with this needless and unhelpful hijab and choir robe war!